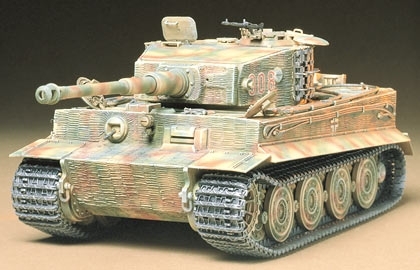 At the time of its introduction in 1942, the German Tiger I was the most powerful and sophisticated tank available anywhere in the world, and is still considered a weaponry masterpiece of that era. Most of the Tiger I's were produced by Henschel, a heavy industry manufacturer in Germany. The later versions of the Tiger I went into production in January 1944, almost two and a half years after its debut. Many features like the thick armor plating, measuring up to 100mm in thickness at some areas, remaining unchanged. Roadwheel improvements consisted of replacing the rubber rimmed roadwheels with new wheels that ran on steel rims, which were insulated from the hub by two rubber rings clamped between disc-shaped pressings. Changes made to the turret were: a commander's cupola with seven vision ports, an anti-aircraft machine gun ring, and a side pivoting hatch; a loader's hatch with periscope; the smoke exhaust outlet relocated to the center of the turret; and internally mounted "S" mine dischargers. The 88mm KwK36(L/56) main gun was considered for replacement with the awesome KwK43(L/71) cannon, as used on the King Tiger, but was never accomplished. It has been said that one Tiger I tank was equal to five Sherman tanks on the battlefield and it was the most feared and respected of all German tanks during the conflict.